I'm glad they're taking care of you. It sounds like you did everything correctly to ensure nothing less. Admittedly, I'm sometimes not the easiest customer to deal with. However it's never without reason that I can objectively and logically justify. So I stopped by the shop and saw the rest of it. They have lot's of space there and are very professional, organized and thorough. They even take full 360 videos of the cars as they pull them in, to protect themselves and the customers from false claims one way or the other. Small update on the situation is this... The body shop was initially unable to reproduce the squeak, but the service manager took them on a ride and were able to hear it loud and clear. He went over his 'attack plan' with me and said we're likely still good for a Friday (tomorrow) pickup. I asked about not just performing the repair, but also fortifying the structure. We briefly discussed potential limitations to their repair scope based on Subaru's spec given that this is a crumple zone, but he agreed that we should probably reinforce it a little. I'll check in again tomorrow. Sorry if some believe I'm providing too much information here. I believe in concise and adequate documentation to cover all aspects of situations like this. It eliminates confusion for all parties involved and provides others with a good idea of transpired events and milestones. Called the dealer to speak with service manager at 12:15pm, he was with a customer so I left a voice mail. I went to lunch at 1pm, stopped by the body shop to check in briefly, car won't be done today. Stopped by dealer, service manager out to lunch, left message for him to call me. Little frustrated right now. I'm OK with things taking longer than expected, but don't make guarantees if they can't be upheld. I'll get over it though, just want this done right. Back to work. Might edit this later for proper sentence structure, etc... right now I just don't care. The service manager just called me back, he already knew I stopped by the body shop to check in on my car. Without either of us really asking how things were going, we both had the "eh, it is what it is" attitude. He detailed what they've done and their results, seems they might have the squeak under control but now there is a "ticking" noise they're looking into. They'll pick up on it again Monday morning. I explained to him that I'm OK with them taking longer than expected to ensure it doesn't reoccur. Yes, it's a bummer that I don't have my STi for the weekend given the plans I have for my fiance's birthday... but this dealership loaner Legacy 3.0 R will get us around. Problem is I'm growing accustomed to this low end torque from the NA engine. Again, it is what it is and I'd rather them take more time to prevent revisit(s) for the same problem. There are times when too much info is tedious, but this ain't one of 'em. Your story many end up helping another member in the future, so the more the better. I don't know how many times I've searched for the answer to something and found many, many threads with the beginnings of trouble-shooting actions, but never any conclusion or followup! I wouldn't be upset about them taking too long, and I for damned sure wouldn't be bothering them about it. As per your last update, they found another issue and are doing the right thing by spending additional time making it right. This isn't a simple chop and swap (or unbolt and swap for that matter,) so cut them a little slack if they don't get it done by Monday, either. The more you bug them, the more likely they'll be to decide that they've fulfilled the scope of work that the dealer tasked them with, and to hell with that new noise. I'm glad that it seems to be going so smoothly, and that it's being paid for by not you! Congrats, brother. I totally agree, I'd be quite alright with this repair taking another week or so if necessary. All I ask is that nobody provides misleading information. I'm a very honest, blunt and thorough person and would prefer those that interact with me sense that and treat me in the same regard. We've made a lot of progress. Not just with the issue at hand, but with the communication techniques as well. My intention of checking in with them isn't to push them to hurry up and finish this... I'm just a very hands-on person and want to be kept in the loop as to what is transpiring. Even if it's just a "no real progress today..." I made it a point to say that to all individuals involved so they didn't feel rushed. I'll update again when I have info next week sometime, I'll be sure to keep this updated through completion. I share your frustration with non-existent or inadequate follow up posts. Last edited by Deek; 08-19-11 at 04:05 PM. Service manager called me today saying they found the "tick". It was bonding material up closer to the driver on the roof. They're fixing that up and will update me after test driving. Looks like I might be back in my STi this week, we'll see. Alright! If you can, make sure to get/take pics of the repair. Did they determine that the issue was where you posted earlier? Did they end up spot-welding, fully welding, riveting or bonding the area? I ask, because you mentioned that you were speaking with the shop about beefing things up a bit. I called the dealer and the service manager is out for today. No update there, so I called the body shop and spoke with the manager to get some info. 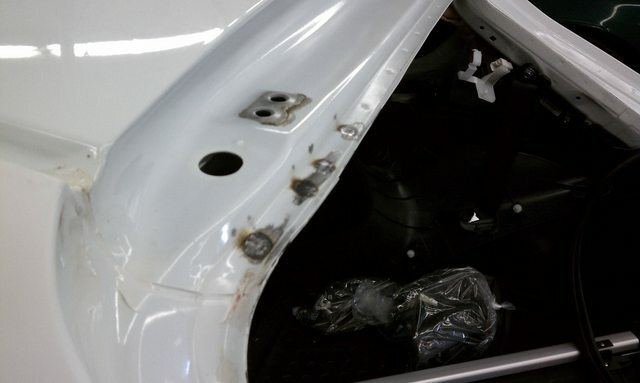 He said they're done with the repairs at this point, but they're waiting for the service manager from the dealer to come by to test drive it before doing whatever paint-work is needed and putting things back together. I stopped by on lunch to see what was done. 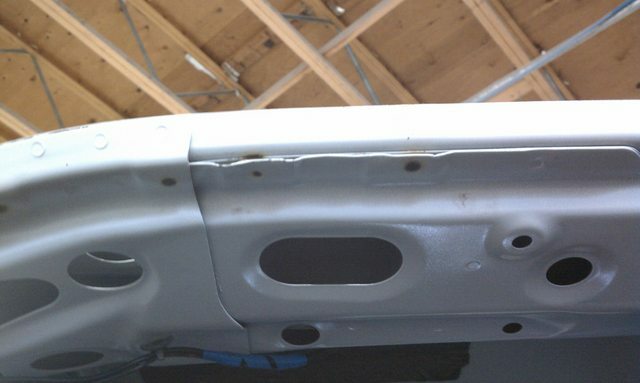 They added some spot welds to both sides of the hatch opening (where my previous pictures highlighted), which stopped the squeak but seems to have brought another 'tick' out. So they traced it to (what I think is the) B pillar roof support, pictured here. 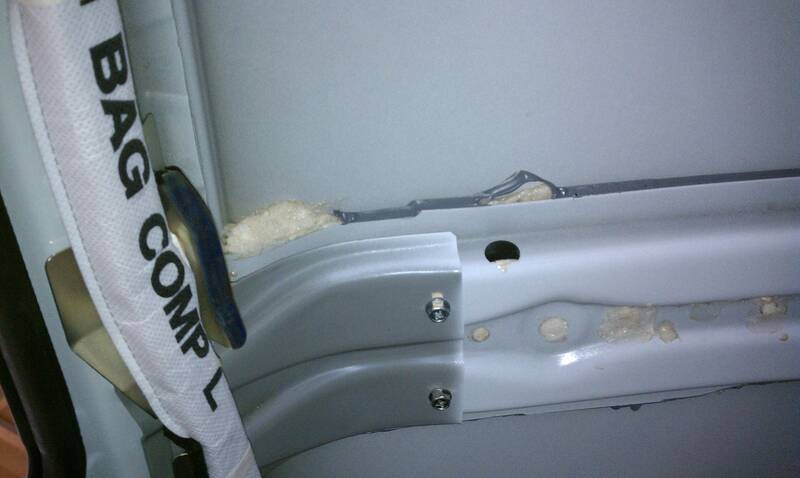 As you can see, they loaded up the support with pillar foam and used bonding material between the support and the roof. They did this for every support & crease in the roof. 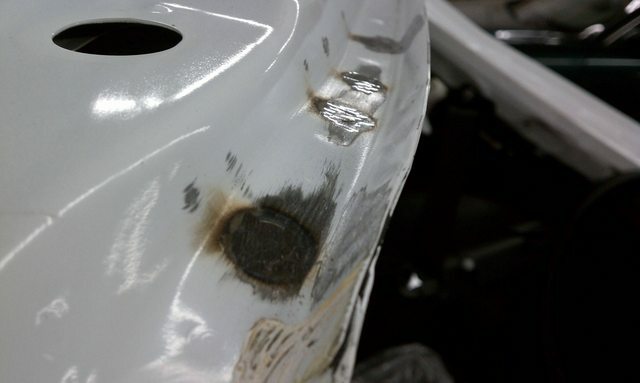 Here are a few pictures of the spot welds. Again, once the service manager from the dealer test drives and approves the repairs, they will do their paintwork and reassemble everything. Interestingly enough, they say that the squeaking very well could have originated from the front parts of the vehicle and just resonated to the rear. I want to believe them, but I am more inclined to think that once they solidified the rear of the roof, the front showed its weak points. Either way, seems to be all under control. Given the fact that the dealer service manager is out of the office today and the body shop is basically waiting on his approval before buttoning everything up, I'm pretty sure I won't be getting the car back for the weekend. Again, it is what it is, and I'll update when I've got something. Last edited by Deek; 08-25-11 at 09:17 PM. Looks like they are doing a good job.